David Lloyd chose our Gripclad GRP Minimesh Grating. Cut to size and then were simply slotted into place. Smart - Solid and another Trusted Safety Solution by GripClad. Do you need rescuing from poolside problems? David Lloyd Leisure offers over 111 Premier Gyms and Swimming Pool facilities across Europe. Most of the swimming pools cater for hundreds of visitors. Conventional white plastic grating often falls through into the drain channel, and would easily break down into its individual pieces because it was interlocking, and would detach itself leaving large sections of the channel uncovered and dangerous. This kind of grating also had a tendency to float out of the channel due to the surface water movement. 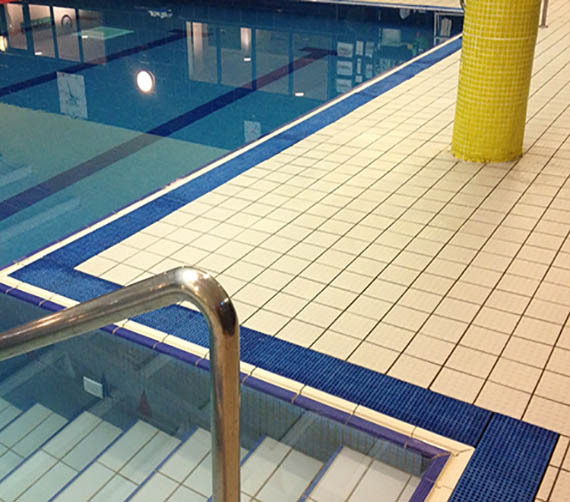 David Lloyd Southampton chose our Gripclad GRP Minimesh Grating in Signal Blue RAL 5005 to match the pool tiles. Cut to size allowing for tolerance on the width and these were simply to slot into place. It was a cost-effective solution which was made to measure. It looks great, it is much stronger as it can be walked on or over (Unlike Plastic Grating). It collects larger debris on top which can be easily removed and is easier to clean. Other benefits include larger debris not collecting in balance tanks and pump strainers as the mini-mesh prevents it from entering the overflow channel.